Previously, on MinerBumping... 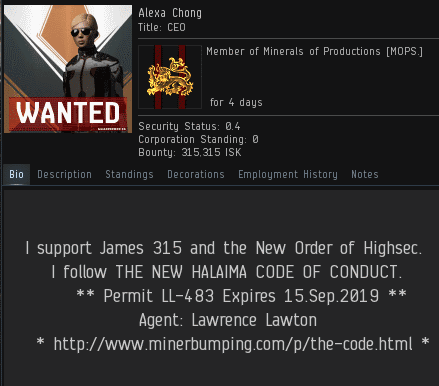 Agent Lawrence Lawton did what any responsible Code enforcer would do: He ganked Banthex for the crime of unlawful mining in highsec. Instead of being congratulated, Lawrence received sharp criticism from Alexa Chong, an associate of Banthex's. Alexa threatened our Agent in local chat and in a private convo. Miners waste their lives mining. As a result, they can't imagine how busy our Agents are with important things. Alexa sent one convo request after another. It seemed clear enough that Alexa and her friend were unable to see reason. Lawrence grew tired of their nonsense, but he was too polite to show it. Our Agent terminated the conversation with clear instructions: The next convo request had better be accompanied by 10 million isk. One of the many glorious things about the Code is that it's available in nine different languages. 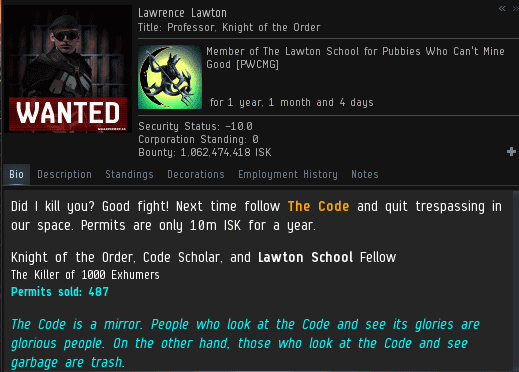 When Alexa received a copy of the Code in her native German, its strong, bold words tickled some part of her brain that told her it was written by highsec's true leader. The next time she invited Lawrence to a private convo, she did so as a permit owner. Of course, our Agent didn't want Alexa's friend to be left behind. 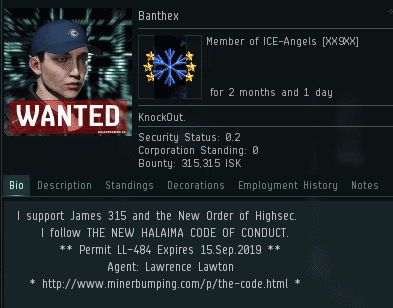 Banthex, too, sent 10 million isk. Now that the money was taken care of, Lawrence invited the miners to partake of his wisdom. Mining ships are slow, but not as slow as their pilots. Lawrence was patient with them. Progress takes time--and it starts with 10 million isk. Miners, the sooner you buy a permit, the sooner you can enjoy the benefits. 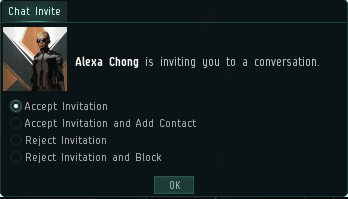 Banthex was treated to the best conversation he'd ever had in his EVE career. He'd given Lawrence some money, but he still owed the Agent a debt of gratitude. Two more profiles to make Anti-Gankers cry. And as for Agent Lawrence? He continued to pursue his passion--killing and educating highsec miners. Those who are armed with the Code never fail. Because the CODE always wins, no matter what language it's in. Always! I cringe when i see a blue cap on a miner. CCP should release it with a propeller for ag to purchase. Shardani had a propeller on his hat. I bet you have a prop on your hat and spin it everytime you post here. Never forget your mentor shardani. agent lawrence must be immediately taken into custody, he is a dangerous threat! I was hoping for some actual space thugs, maybe next time!